Romacorp, Inc. launches new concept, additional Winter Park location planned for summer. Romacorp Inc., parent company of Tony Roma’s restaurants, announces the launch of its newest concept, TR Fire Grill, a chef-inspired American bistro with innovative dishes from globally recognized Chef Bob Gallagher. 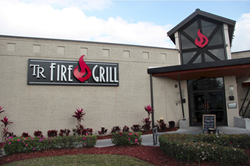 Located near the Orlando International Airport on South Semoran Boulevard, a second TR Fire Grill is planned to open this summer in Winter Park, Fl. At TR Fire Grill, guests can choose from menu items using the highest quality, freshest seasonal produce from farms in Central and South Florida. Steaks are fresh, never frozen, aged and then hand cut daily in the restaurant. The filet and NY strip are from ranches that follow the strict guidelines of the NatureSource® Natural Beef program, known for its pasture-raised, grass-fed beef produced without antibiotics, hormones or GMOs. Smoking and grilling are essential to the experience, and TR Fire Grill proudly smokes all of their meats and vegetables in-house daily using hickory wood. Combined with the wood burning grill and house made sauces, this care and attention to detail gives you the most authentic, robust flavor that you can find. The bar menu features the very best in American craft beer, wine, bourbon and artisanal cocktails. Bartenders age tequila and pisco in small oak barrels, and take the craft of making the perfect cocktail to a new level by grilling fresh fruit and infusing the flavor into premium liquors in glass vessels at the bar. Romacorp’s second TR Fire Grill will be located in the heart of Winter Park, Florida in the Ravaudage development at the corner of US 17-92 and Lee Road. Construction on the new building has started and the restaurant is planned to open this summer. Stephanie Kolp, Uproar PR for Romacorp, Inc.